Koh Chang is a large island and there many things for visitors to see and do. Whether you want to visit the fishing villages in the south, swim in one of Koh Chang's beautiful waterfalls, walk along some of Koh Chang's tropical beaches or just sit back and take in the some of the stunning views from any Koh Chang's spectacular view points your going to need to get there. One of the best ways to see Koh Chang is to take one of our Koh Chang Sightseeing Tours. We will make sure you get to see everything there is to see without the hassle of having to drive yourself. There are many ways to travel around on Koh Chang but probably the easiest and safest way is to catch one of the many Songthaew taxis that travel up and down the Koh Chang. Songthaew taxis can be flagged down from anywhere along the roadside or from out side of you hotel. Once you have negotiated a price just jump in the back and the driver will take you to where you want to go. The average cost of a taxi on Koh Chang is about 40 baht from one town to the next (per 5 km). 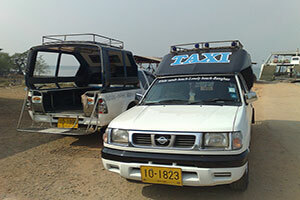 Generally, taxis do not travel along the east coast of the Koh Chang. Having your own vehicle will make it easier to get to those tricky out of the way places. For example, it is unusual for a taxis to turn off of the main road and take you to one of the waterfalls or down some of the long tracks that lead to more remote beaches. Normally you will be dropped at the nearest point on the main road and have to walk the rest of the way. Koh Chang has a wide variety of vehicles for hire. Cars, Suzuki jeeps and station wagons can be hired in most major hotels, tour agencies and from local street dealers. 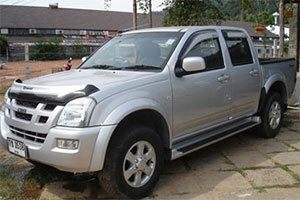 If you really want to explore Koh Chang, then having your own vehicle is the best way to go. Do check that full insurance cover is included and always carry your driving licence. An International or country licence is acceptable. High season prices should range between 1,300 baht for a smaller Suzuki jeep up to 1,600 baht for a Toyota Hilux Pick Up. As always in Thailand prices can be negotiated for longer rental periods. Motor cycles and Scooters are a popular and very convenient way to travel around and having your own transport will give you the freedom to come and go as and when you please. Motor cycles and Scooters can be hired in most major hotels or tour agencies. 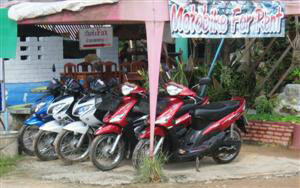 The cost of hiring a motorcycle is between 150 and 250 baht per day. Insurance is normally not included. Please ensure that you wear your safety helmet! !!! Koh Chang Safety !!! Some words of warning - Take great care on the roads on Koh Chang. Not only is there an extreme disregard for traffic regulations that leads to unexpected and dangerous behaviour on the roads but during the rainy season bike riders often come to grief when damp roads become very slippery. There are also some very steep hills in some sections of Koh Chang. Particularly bad stretches of road are located between Klong Son and White Sand Beach and also between Kai Bae and Lonely Beach. The Road on Koh Chang has numerous hairpin turns, some high up on the cliffs where there is no room for mistakes. It's probably better if you're an inexperienced rider to forget the bike and go for the safety of a car or jeep or catch one of the many Songthaew taxis. You can also book one of our organised day trips to see Koh Chang. We promise you will get to see all everything there is to see with out the hassle of driving on unfamiliar roads. Safety Helmets - The wearing of a safety helmet is compulsory when riding a motorcycle in Thailand but this rule is often ignored on Koh Chang. Be forewarned, if you are stopped by the police for not wearing a helmet you will receive an on the spot fine. Helmets should be provided at the time of renting a motorcycle. Please wear it! It could save your life.